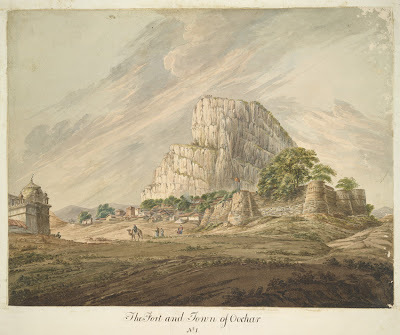 Watercolour, attributed to William Prinsep (1794-1874), of the town of Orchha in Madhya Pradesh, beneath its massive rock, with the fort and a mosque in the foreground, dated 1818. 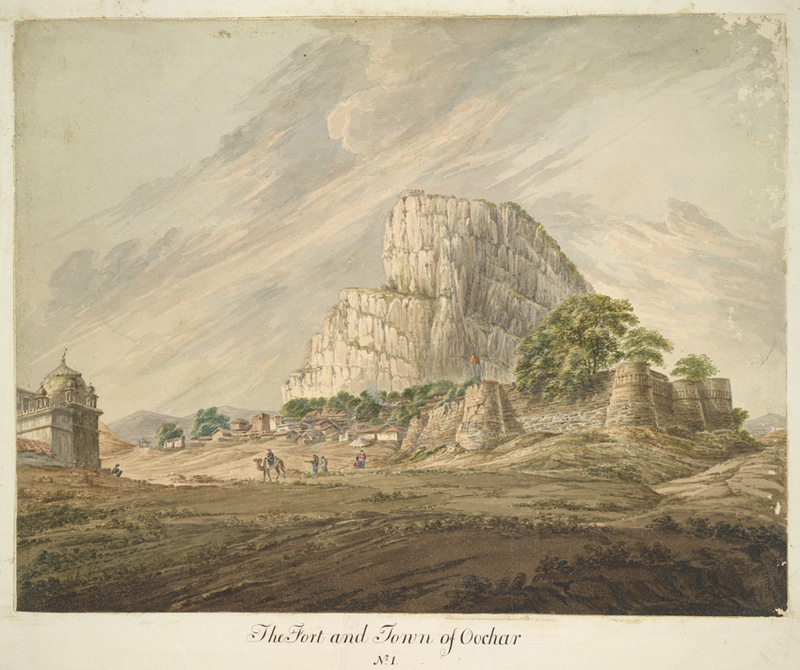 The image is inscribed below: 'The Fort and Town of Oochar. No. 1.' The area is famous for its pinkish-grey granite outcrops of rock. Orchha, meaning 'hidden place', is situated near the Betwa river. Orchha's Fort complex contains the Raj Mahal , the Rai Praveen Mahal and the Jahangir Mahal. The Raj Mahal is a medieval granite bridge built by Rudra Pratap and completed by Madhukar Shah. The Rai Praveen Mahal was built in the mid-1670's by Raja Indramani for his concubine. The Jahangir Mahal was built by Bir Singh Deo.